3 Things I learned on my journey in Baja with Root Adventures + GIVEAWAY! Wow - to think it’s been over a month since I returned from Baja California Sur, Mexico with Root Adventures and I still RAVE about my experience. This trip was truly one of a kind. From swimming with sea lions, to devouring ceviche (caught that morning) with my toes in the sand, to star gazing under the most incredible night sky from my glamping tent on our private island- yes, I GLAMPED - it was so special. Breanne, founder of Root Adventures, graciously invited me to experience the trip and I was pumped! I packed my tarot cards and crystals and made my first ever trip to Mexico. And while in this blog post I could go on and on about the details of what we did, I also want to share my 3 greatest takeaways and the lessons and moments that impacted me in just 4 days. You truly CAN unplug - and be justtttt fine. While I hope it’s not because I’m a millennial (insert eye roll), and maybe it’s because I’m a bit of a workaholic, but I’d be lying if I didn’t admit the idea of having no access to cell service or Wifi didn’t make me sweat leading up to the trip. But the gift of unplugging and finding presence will never disappoint. Particularly on the island, I felt more connected to my intuition (helpful in the tarot reading!) and creatively. I spent time on the boat and on the beach simply reflecting rather than DISTRACTING. What was insightful and interesting was seeing all the women’s responses to not being plugged in and connected to their electronic. We all felt it on some level, some of us much more than others, and explored this in our conversations. Learning from a diverse group of women is POWERFUL! This was my absolute favorite thing about the trip. While the crystal clear blue water and whale watching were incredible, nothing beat the conversations I had over wine and great food at night, or on the beach under our umbrellas. The trip with Root was easily the most diverse mix of 16 women. From geographically where we were from, to age and experience. I LOVED that about this trip. To learn what each women has accomplished professionally, personally, and spiritually over her lifetime was so profound. I gifted readings to each retreat guest, and really enjoyed having that 1:1 conversation with the women. I found that the themes, fears, and worries were all so similar. We’re far more similar and connected than we take the time to acknowledge. The last evening of the trip we spent in a circle in one of the tents on camp. We went around and first reminded each woman of her superpower (the opening ice breaker question the trip leaders posed to the group) and collectively showered her in compliments and truths explaining why that IS her superpower. Hours passed, we closed the circle, and enjoyed that last moment of connection before returning to the “real” world the next day. Our piece of paradise held some beautiful memories. Release - of expectations and control of the outcome - yields the best results. This happened a few different ways this trip. 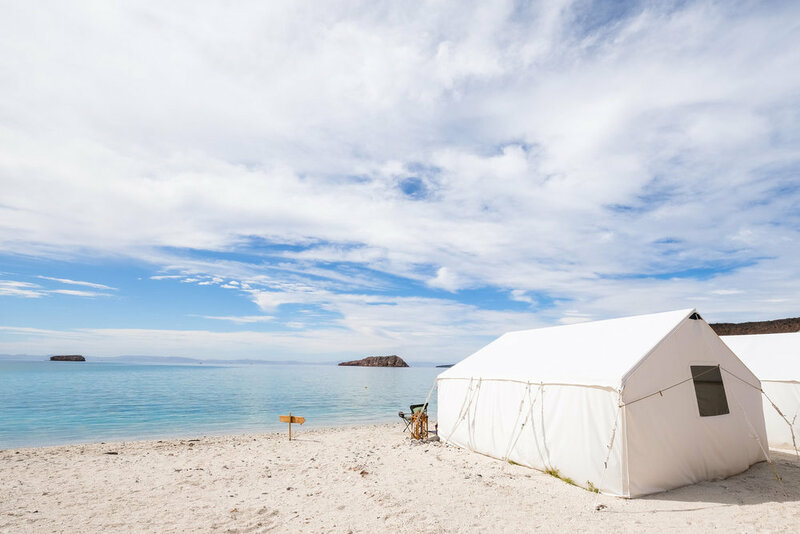 First, I didn’t obsessively research the island and glamping experience at Isla Espiritu Santo. Breanne was so warm, knowledgable, and organized in all our conversations leading up to the retreat, and assured me that my lack of camping experience was NO issue. I’d be comfortable, safe and ENJOY it. While a part of me wanted to review my packing list 10 times over, and stress about the details, I instead challenged myself to embrace the unknown, remembering it’s an EXPERIENCE unlike anything I’ve ever done. I chose to trust myself a bit more. Sure enough, I arrived and Camp Cecil had every amenity I’d dream of in a glamping experience & more. With a cold margarita in hand I watched the sunset, stowed my phone away, and just leaned into the uniqueness of this adventure. Another way our group embraced the unknown and released expectations this trip was in our journey to the island. Because Espiritu Santo National Park is in the Sea of Cortez, and required an hour long boat journey to arrive on camp. Because of weather and wind, we were not able to make it to the island as soon as we had hoped. Bummer. BUT that’s the ebb and flow of travel, particularly adventure travel. 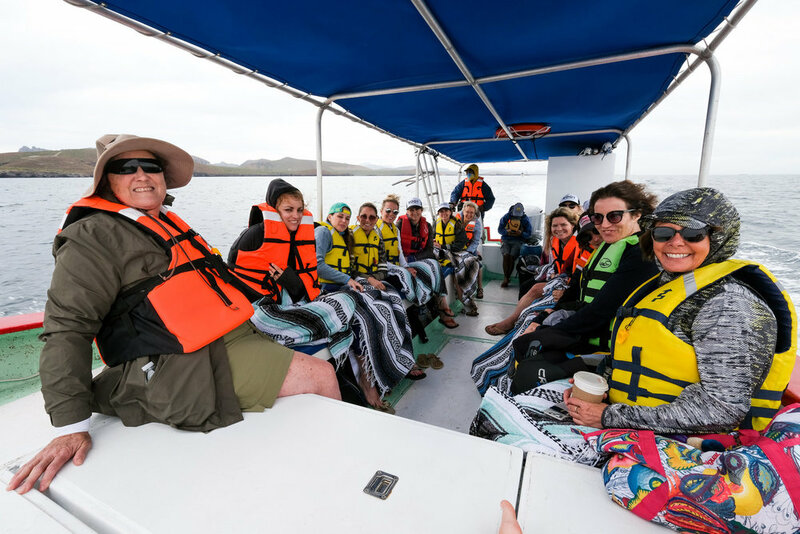 Root Adventures and the team at Todos Santos Eco Adventures crafted new experiences to the itinerary including scenic hikes, picnics on the beach, kayaking and paddle boarding, and more. It worked out, perfectly. In the end, weather settled down and we WERE able to spend our last evening on the island, and it was magic. I think it was no surprise that divine timing worked in our favor, and we were rewarded for our patience on the way to camp. We saw numerous whales on our boat ride in, and dolphins GALORE after our trip to snorkel and swim with the sea lions. Our guides and leaders (who were FANTASTIC!) reminded us that this doesn’t happen regularly. Whale watching is not to be expected in that area, but instead a very special gift. ROOT IS GIVING AWAY AN ADVENTURE TO COSTA RICA!! Want to win a trip with Root this May??? Follow Root Adventures, Mother Dirt, Soul Seal, and The OM Collection on Instagram. Post a picture on Twitter, Facebook or Instagram of your favorite yoga pose in the outdoors and caption why you want to join us in Costa Rica! Tag Root Adventures (@rootadventures), Mother Dirt (@motherdirt), Soul Seal (@soulsealmats), and The OM Collection (@theomcollection) in your post.